Passengers on the Leigh to Manchester Guided Busway are being short-changed with overcrowding at ‘dangerous’ levels. That’s the message to transport bosses from Worsley and Eccles MP Barbara Keeley, who has slammed reports of passengers being left behind at the park and ride station near the M60 in Walkden, and buses so full one user fainted. Ms Keeley says she has been approached by multiple local residents in Walkden and Worsley to complain about the £68m service. She accuses bus company First of “raking in the profits…[while] being complacent” and failing to invest in enough new buses to meet demand. Reports from the community suggest passengers are being forced to sit on the stairs because of a lack of seats and that overcrowding is now “the norm” on the route. In January 2015 First Bus won the contract to run the Leigh-Manchester Guided Busway. The 14-mile route runs along the busy A580 East Lancs Road and includes a 4.5-mile guided section between Leigh and Ellenbrook. The service finally launched on 3 April 2016. But while park and ride and passenger numbers started slowly, by September 2016 the service was attracting 39,000 passengers a week. 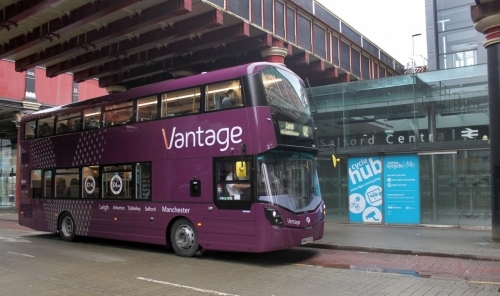 At the moment Vantage buses are scheduled to run eight times an hour Monday to Saturday daytime on two routes between Leigh, Tyldesley, Salford and Manchester, and from Atherton via Salford to Manchester. Transport for Greater Manchester’s Head of Services Nick Roberts says this amounts to a service which is “extremely successful”, but growing demand has forced them to introduce two more buses at peak times. This will add an extra capacity for 120 people. Ms Keeley said: “I have serious concerns about the current Guided Busway service on the East Lancs. “It is completely unacceptable that local residents are being forced to choose between boarding dangerously overcrowded bus services to try to get to work or being forced to wait for long periods of time for other buses to arrive. In response TfGM’s spokesman said: “The nature of the busway service means that only adapted vehicles can operate on it. “An additional five new buses will also be added to the fleet by January. “The growing demand for these services is being addressed by the operator First Manchester with the immediate introduction of two additional buses during the peak-time service providing space for an extra 120 people. Ms Keeley says she will continue to pressure transport chiefs to take more steps to improve the service. “The only actions we have been promised are too little and too late. “Running one extra bus in the morning peak time is not going to help enough, given the numbers being forced to wait. “Having to wait until January for other extra buses means months of misery for passengers when mornings will be darker and colder. Ian Humphreys, Head of Commercial First Manchester said the service had “gone above and beyond expectations” and the company had already made changes to deal with capacity. “It’s important to clarify that the Vantage Busway services are being delivered in partnership with TfGM, Wigan Council, Salford City Council, Manchester City Council and First Manchester, and this therefore means that being able to introduce more buses, is not a decision that falls solely with First Manchester,” he said. “In the last week we have changed timetables to create more seats during peak times, and the business has also added two extra buses, which allows First Manchester to make more journeys each day. “We have already received an encouraging response from customers following the changes, with many tweeting us to thank First Manchester for the extra journey from Newearth Road, which has led to a noticeable improvement in the previously flagged capacity issues. “In response to the comments raised this week, we have been undertaking further roadside observations to identify how we can introduce additional resources that can be targeted at the right time and place. Tom is SalfordOnline.com's News Editor and community co-ordinator.